A man who got into a row after trying to touch a bearded seal which had taken up residence at a Shetland harbour has been fined. The bearded seal - normally found in icy Arctic waters - had made headlines in May after arriving in Lerwick. 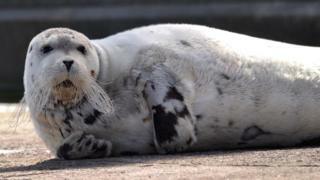 The town's sheriff court heard Karl Tulloch, 61, approached the seal in the early hours of 19 May and tried to touch it. A taxi driver intervened and Tulloch rounded on him shouting and swearing. Police were called and Tulloch continued to shout and swear, and ignored instructions to move away from the animal. Tulloch admitted behaving a threatening and abusive manner. Sheriff Ian Cruickshank told him that no matter how honourable his intentions it was better to stay away from bearded seals in future.